Final Day of Free Performances at the Tidal Basin Stage! See link above for the full schedule of performances, scroll down to the bottom of the page. Today's lineup includes Irish Dancing, Batala all-women percussion group, Hawaiian Hula & Polynesian dances, and more! 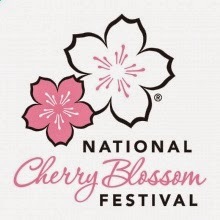 The beautiful and delicate cherry blossoms cultivated in the National Mall and Memorial Parks have inspired generations of viewers since 1912. A gift from Japan, the flowering trees symbolize friendship between nations, the renewal of spring, and the ephemeral nature of life. Blooming occurs between mid-March and mid-April depending on the species of tree and annual environmental conditions. Programs include: Cherry Blossom Ranger Talks, Walk with a Ranger, Lantern Walk, Bike Tour, Running Tour, and more events for kids and even one for dogs! Celebrate the Anacostia River, its history, ecology and the communities that live and work alongside it. This Free event will bring together residents from across the region to engage in hands-on art workshops, musical performances, tours of historic Anacostia, boating and even fishing workshops! Metro: Anacostia, Free shuttle buses will run from Anacostia and Eastern Market metro stations to the Festival. Driving? Free parking available at Maritime Plaza 1220 12th St SE and Anacostia Metro Station 1101 Howard Rd SE. Free shuttles from both sites. Biking? Free bike valet! Capital Bikeshare station at Anacostia Metro.